Born in nuclear fire, the kaiju stride across the face of the world, unstoppable. Only one power can hope to match these giant monsters: the Mecha Assault Force! Become a fearless mecha pilot in this anime-inspired role playing game powered by the Fate Core engine. Craft your character based on anime archetypes. Design giant robots with custom-made weapons, armor, and other exotic systems. Pit your players against monstrous kaiju capable of leveling cities. Enter an intricate setting inspired by giant monster movies, military robot anime, and martial arts epics. 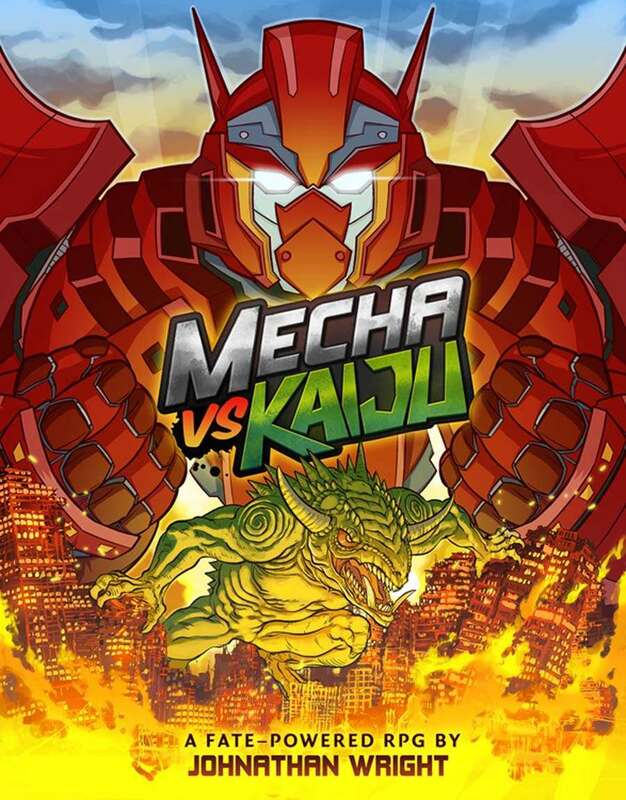 Uncover the secret history of Japan and use its wealth of story possibilities to inspire your own battles in the relentless, never-ending conflict of Mecha vs Kaiju! MECHA ASSAULT FORCE - IKIMASU!!! Anime-inspired Archetypes with unique stunt trees. New modern-day Skills with matching associated Stunts. Rules for the Supernatural, allowing players to use science, reilgion, or both as a basis for exploring the unknown. A complete Mecha and Kaiju Creation System, including numerous optional rules to match any style of play. Create Aspect-only mecha, or go in depth with a point-based system capable of crafting any giant monster or robot you can imagine. Play during any era of "kaiju eiga" (monster movie) using a complete Alternate History of Japan, from the creation of the first kaiju at the end of WWII through to the modern era. This timeline mirrors the famous giant monster films of history, and indeed assumes that every one of them actually happened. Gamemasters will find inspiration in the Secret History of Japan, reaching back to its mythological beginnings and incorporating many of the great moments in the nation's history. Finally MvK features a complete Campaign, plotted like an epic TV series, that sees players grow from raw recruits to mecha aces! Mecha vs Kaiju requires the Fate Core rules to play. Would this book be useful just for its FATE Mecha design and rules features? Is it broad enough to apply to other settings? Perhaps military sci-fi one without giant monsters? It's pretty broad, it also has points (basically stunts in Fate) for Kaiju and I've been using them to make my Fate Pokemon game fleshed out. You can definitely have mecha vs mecha, and there's optional rules for size and scale as well. Downloaded a copy of this and the character sheets. None will print out. The game is useless if you can't print out character sheets. Please email me at publisher@mechavskaiju.com and I'll make sure to clear up any problems. Thank you. There's been an unfortunate delay in the sale of the print version. We are working to correct this problem and hope to have this feature available soon. Thank you for your patience. As you can see these problems have been solved. Thank you all for your patience, and enjoy your printed version. ICHIMAS!!! Update: Thank you, Jonathan Wright for the reply to my email. It's not every day I get to hear from an author. Thank you for taking the time to address the situation. I look forward to getting this book soon. Awesome!